Petroglyphs are “rock carvings.” From petro, meaning “rock” and glyph, meaning “symbol,” petroglyphs are a form of rock art that consist of designs carved into the surface of natural rock. Forms include lines, dots, numbers, letters, human, animal, supernatural beings or astronomical images. They are found throughout the world and can date as far back as tens of thousands of years ago. For more than 40,000 years, humans have been inspired to create what archeologists call “rock art,” meaning the paintings and engravings which are found on natural stone surfaces. Although it is often times called rock art, don't let the name fool you. Native American rock art provides us with many clues in our search for the history of the continent's native inhabitants. The painted or carved symbols are not writing, as we know it, but they were created to convey information, to tell a story or legend. Their meanings are not always known, and are sometimes debated among scholars. Petroglyphs generally predate any given written language, so it remains an integral part in studying the indigenous peoples. So when you think of a petroglyph, imagine someone hitting the google plus button long ago and sharing their personal story with you, with us. Ethnographic information has suggested that rock art served several functions. Some rock art styles could be boundary markers for clan territories or guides to water and food resources, while others may record historical events such as astronomical phenomena or the arrival of Spanish explorers. Some rock art motifs resemble the visionary imagery of trance states, which Native American shamans entered to communicate with the spirit world. Rock art can range from simple scratch marks to elaborate motifs. Some common abstract design elements include circles, concentric circles, spirals, dots, and meandering lines. Representative designs include human forms and animals. Human forms with horns or radiating wavy lines and animals such as the lizard and rattlesnake are thought to be symbols of power or spirit helpers. (Right) Winter Solstice on Northern Hemisphere. Astronomy is one of the oldest sciences, and ancient cultures and early civilizations, such as the Native American, performed methodical observations of the night sky. The ancient Incas celebrated a special festival to honor the sun god at the time of the December solstice. In the 16th century ceremonies were banned by the Roman Catholics in their bid to convert the "Inca Civilization" to Christianity. A local group of Quecia Indians in Cusco, Peru, revived the festival in the 1950s. It is now a major festival that begins in Cusco and proceeds to an ancient amphitheater a few miles away. Petroglyphs are “rock carvings.” From petro, meaning “rock” and glyph, meaning “symbol.” Petroglyphs are a form of rock art that consist of designs carved into the surface of natural rock. Forms include lines, dots, numbers, letters, human, animal, supernatural beings or astronomical images. They are found throughout the world and can date as far back as tens of thousands of years ago. For more than 40,000 years, humans have been inspired to create what archeologists call “rock art”: paintings and engravings on natural stone surfaces. Native American rock art provides us with many clues in our search for the history of the continent's native inhabitants. The painted or carved symbols are not writing, as we know it, but they were created to convey information, such as a story or legend. Their meanings are not always known, and are sometimes debated among scholars. Rock art can range from simple scratch marks to elaborate motifs. Some common abstract design elements include circles, concentric circles, spirals, dots, and meandering lines. Ethnographic information has suggested that rock art served several functions. Some rock art styles could be boundary markers for clan territories or guides to water and food resources. Others, however, may record historical events such as astronomical phenomena or the arrival of Spanish explorers. Some rock art motifs resemble the visionary imagery of trance states, which Native American shamans entered to communicate with the spirit world. Representative designs include human forms and animals. Human forms with horns or radiating wavy lines and animals such as the lizard and rattlesnake are thought to be symbols of power or spirit helpers. 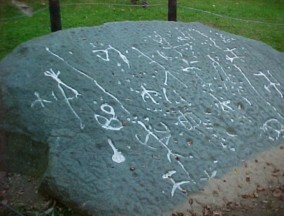 Judaculla Rock is a soapstone boulder carved with symbols, perhaps from Indians, dating from 12,000 B.C. to 400 A.D., and is sacred to the Cherokee. Judaculla Rock is North Carolina’s best known and largest example of an American Indian petroglyphs site. In the modern and generic sense, it is a public attraction and a point of interest, and is commonly identified as a boulder covered with ancient and mysterious engravings. It is much more. Judaculla Rock is one of several petroglyph boulders within a 15 acre area that is an archaeological site of great significance. Broader still, the Judaculla Rock site is but one landscape component of a prominent Cherokee legend that chronicles the vast supernatural and physical realm of Judaculla. Judaculla is the anglicized pronunciation of Tsul Kalu, as documented by the Bureau of American Ethnology’s James Mooney in the late 19th Century. Mooney, along with several other visitors to Cherokee territory, recorded varying tales of a legendary giant. By all accounts, Judaculla was a human-like giant with supernatural powers, who traveled between This World and the Underworld. On a 1900 map by Mooney, Judaculla Rock is mapped along with principal Cherokee towns and other notable major features, suggesting its relative importance to the Cherokee people. The name of the giant - Tsul Kalu – means “he has them slanting,” being understood as referring to his eyes. Of his otherworldly powers, the slant-eyed giant primarily was considered to be the Master of all Game Animals. In their daily lives, the Cherokee included his name in their formulas, rites, and rituals to ensure success in hunting. The geographic region associated with Judaculla includes at least 12 prominent place-names or features that give testament to his reign, encompassing an 800 square mile region. Kanuga Town, and a mound that was located there, is the initial setting for the Judaculla story, and the hometown of his wife, her mother and brother. Judaculla lived atop and within the great Balsam Mountain Range, more specifically at Tanasee Bald and the Devil’s Courthouse. The Tanasee Bald area was called Judaculla Old Fields by early settlers and was considered to be both Judaculla’s farm and one of his Underworld entryways. On the next mountain top over from Tanasee Bald, Judaculla sat upon his great mountain top judgment seat with a commanding view down upon all of those who may partake in the hunt of his game. The place was later misnamed the Devil’s Courthouse, due to early American visitor accounts of Judaculla being a type of Devil. Located just below Tanasee Bald and the Judgment seat, are the ridgetop balds of Judaculla Ridge and Old Fields Ridge, said to be huge fields once farmed by Judaculla. Looking Glass Rock is a nearby granitic dome mountain, and the place where Judaculla is said to have seen his own reflection. When wet or icy, the granite cliff faces reflect light and only a giant could stand so tall to see himself at those great heights. There are four principal explanations and beliefs to the surrounding area and origin of Judaculla Rock: Cherokee legend Tsul Kalu, ancient civilization, alien civilization, and even the gods inhabited the area. The glyph origin story tells of Judaculla in chase of rogue hunters, and he leapt down from his mountaintop fields and landed in the Caney Fork creek bottom lands (a distance of over 10 miles and 3,200 feet). As he landed he stumbled and put out a hand to keep from falling. His hand pressed against a giant boulder to steady his massive frame. In so doing he left several indentions including an impression of his hand. Then with the with the nail of his right index finger, he drew a sharp line across the face of the rock that was to remind people that harm would come to those who crossed it without first going through the appropriate rituals. Shining Rock, is yet another place of reverence for the Cherokee, and also the general location for petroglyphs. The Cherokee know Shining Rock area as “Where the tracks are this way.” Here, Judaculla’s children left tracks in the rocks while on their way from Kanuga to their home at Tanasee Bald. Researchers in the Cherokee Studies program at Western Carolina University recently have deciphered the term Cullowhee as a shortened and anglicized form of Jutaculla-whee, meaning Judaculla’s Place. Cullowhee is located six miles northeast of Judaculla Rock. As at Kanuga, a mound once was present at Cullowhee, on what is now the Western Carolina University campus. Today the Judaculla Rock is owned by Jackson County, having been donated in 1959 by the Parker family, very conscientious caretakers who still own the surrounding lands. Since 1959, the one-acre county-owned area around the rock has undergone a variety of improvements that concluded with unintended negative impacts. In 2005, worsening site conditions led the North Carolina Rock Art Project and Western Carolina University professors to initiate preservation efforts. In 2007 Jannie Loubser of Stratum Unlimited and soil scientist colleague Douglas Frink were hired to complete a conservation plan for Judaculla Rock. Loubser’s initial condition assessments found nearly one-half of the rock had been covered with sediment since the 1920s, most since the 1960s. Loubser’s ethnographic, historical, and archaeological work at the site resulted in the most extensive documentation of this cultural resource to date. 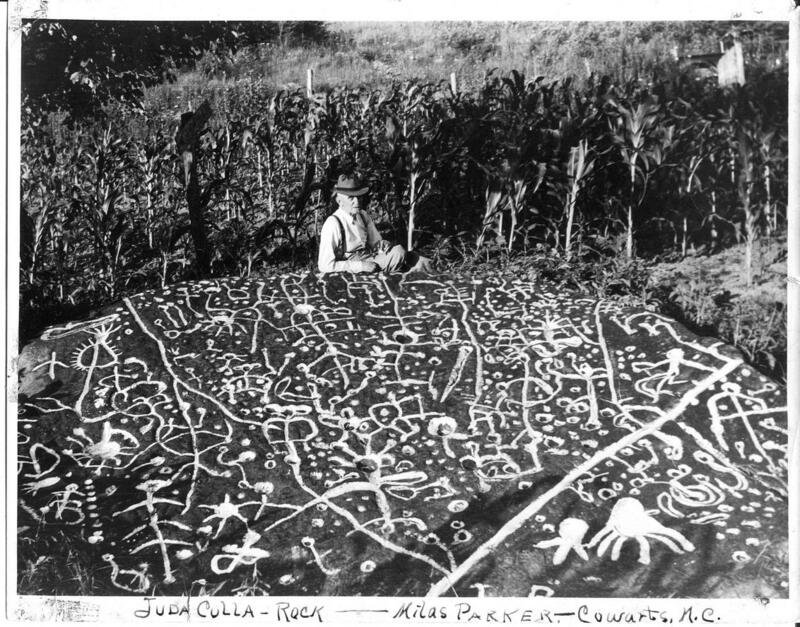 He believes petroglyphs on the Judaculla Rock are the most extensive and complicated known to exist not only in North Carolina but also in the entire region east of the Mississippi River. With a meticulous study of the petroglyphs formation, Loubser developed the first tangible chronology for the rock. Soapstone quarrying began in the Late Archaic period, roughly 3,500 years ago. More recent cupules, nested rings, cross-in-circle, and stylized figurative motifs probably date to somewhere between the Middle Woodland to Late Mississippian periods and perhaps even into the early historic period (late 1700s). Glyph carving was episodic and the chronological placement of these probably falls within the Late Woodland to Late Mississippian periods—or about 500 A.D. to 1700. Loubser devoted a large section of the Judaculla report to identification and interpretation. He makes an appealing argument for the rock being a three-dimensional picture map of Judaculla’s world—a highly stylized scale-model of the surrounding sacred landscape with its mountains, rivers, trees, villages, and spirit beings. The Cherokee’s post European/American contact story is one of strength and perseverance. 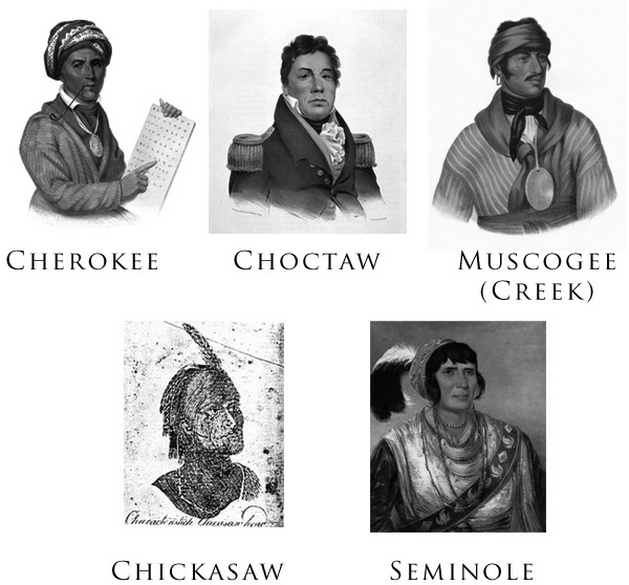 The well documented 1830s Trail of Tears tragedy split the Cherokee into two groups now known as the Cherokee Nation and Eastern Band of the Cherokee. Even in the theater of intense cultural conflict and displacement, many Cherokee maintained an intimate relationship with Judaculla Rock. The Eastern Band of the Cherokee has emerged as a principal partner in efforts to protect, enhance, and celebrate the Judaculla Rock cultural site. 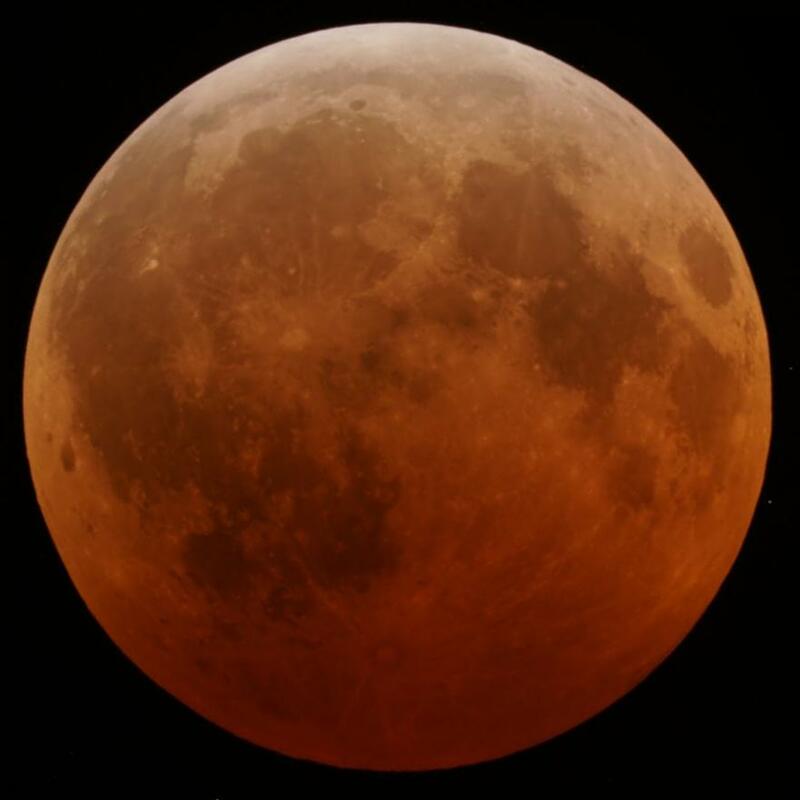 (Right) Total Lunar Eclipse on Winter Solstice. Part travel guide to the wonders of the world and part primer on ancient world history, Ten Discoveries That Rewrote History captures the awe and excitement of finding a lost window into ancient civilization. About the Author: Patrick Hunt is in the Classics Department at Stanford University, where he has been teaching archaeology, mythology, and art history since 1994. He has been featured on the History Channel and in Archaeology magazine for his Hannibal alpine research and directs Stanford’s Alpine Archaeology project in France, Italy, and Switzerland. Ray Urbaniak, Rock Art Researcher specializing in Solstice & Equinox Markers and author of "Anasazi of SW Utah: The Dance of Light & Shadow." In addition to the grooves and figures the rock has a lot of cupules, circular indentions in the rock, that are among the oldest forms of Rock Art that have been found in the world, some dating back as much as 50,000 years. Large deep groove was very similar to many Solstice & Equinox Horizon Pointers I have recorded in Utah. Exact horizon view was obstructed by recently planted reeds or bamboo plants, however, on a slight hill the view was 304 degrees. Compass direction read 304 degrees. It was close to the Summer Solstice Sunset point. Compass pointed to a natural viewing point on the horizon. It indicates that the rock was selected because it was positioned to view the Summer Solstice Sunset and was therefore the logical place to peck in a Summer Solstice Horizon Sunset pointer. Rock was most likely used as a Summer Solstice Sunset observation point and possibly as a Winter Solstice Sunrise observation point as well if viewed in the opposite direction. Ray later checked the declination (correction factor for Magnetic North vs. true North) for Sylva, North Carolina, and also checked the U.S. Naval Observatory web site to find the azimuth (degrees clockwise around a circle starting at due North) for the setting Sun on the Summer Solstice for the Sylva, N.C., area. This turned out to be 298.3 degrees and the declination correction factor for Sylva turned out to be minus 5.3 degrees. Therefore 304 minus 5.3 degrees was an almost perfect match of 298.7 degrees. Both of these solstice pointers need to be observed directly for visual confirmation, but it is highly likely that this is the first Solstice Marker to be confirmed in North Carolina. “It has been suggested that some sites appear to be related to comets or solstice observations. But again, there is no site in North Carolina thought to serve this purpose,” concludes Urbaniak. Rock Symbols of Unknown Origin? Stone Symbols of Unknown Origin? Alien Civilization? Alien Signs? Future improvements will include the distinctive touch and perspective of the Cherokee including interpretation and signage that will be in both English and the Cherokee language. Both the enduring story of Judaculla, and that of the Cherokee People is one of permanence and fortitude, whose signature on the mountainous Southern Appalachian landscape continues to stand the test of time. 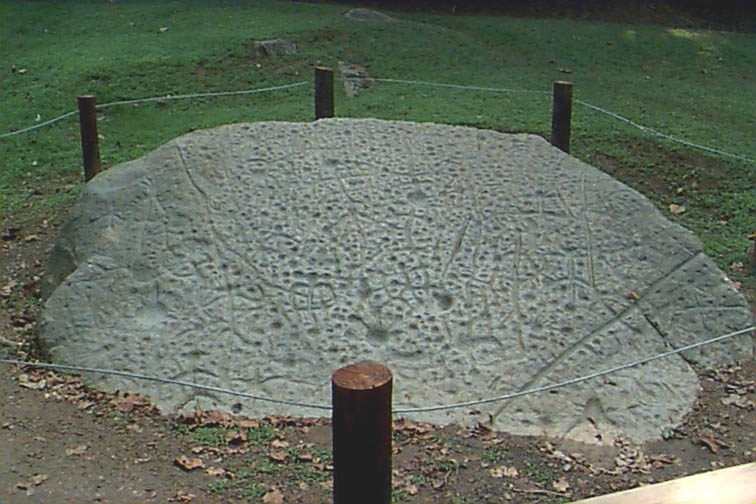 Judaculla Rock, located in rural western North Carolina, is a large soapstone boulder whose surface is covered with carvings. The rock has sometimes been described as depicting a map of a battle in 1755 between the Cherokee and their enemies. Some people believe this battle was between the Cherokee and the Creek Nation, while others believe the Cherokee fought with the Catawba. In reality, the carvings are probably much older. Archaeologists studying soapstone quarries believe the Judaculla Rock was probably carved during the time archaeologists call the Late Archaic, which dates from 3000 to 1000 B.C. Outcrops of soapstone, used by Native Americans in the past to sculpt pipes, beads, bowls, and bannerstones, are located near the Judaculla Rock. Archaeologists think Native Americans camped at, or near, the rock when they came to quarry the stone. 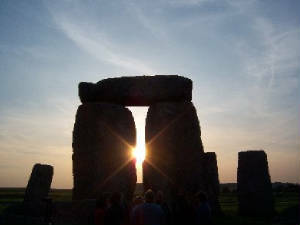 (Right) Winter Solstice Sunrise at Stonehenge. Worldwide, interpretation of the Winter Solstice has varied from culture to culture, but most cultures have held a recognition of rebirth, involving holidays, festivals, gatherings, rituals or other celebrations. James Mooney, a researcher at the Smithsonian Institution who collected southern Indian stories, recorded the Cherokee legend of Judaculla Rock in the 1880s. According to Mooney's story, a being named Judaculla (called by the Cherokee Tsul-ka-lu, or the Great Slant-eyed Giant) was a giant hunter who lived atop a mountain at the head of the Tuckaseegee River in Jackson County. Judaculla was very powerful and could control the wind, rain, thunder, and lightning. The carvings on the boulder represent scratches made by Judaculla's feet as he jumped from the top of the mountain to the creek below. The seven-toed foot at the lower right hand side of the boulder is said to depict Judaculla's footprint. More than 275 authorities who know and revere these places wrote essays, including Suzan Shown Harjo, Frederick E. Hoxie, Clara Sue Kidwell, Rennard Strickland, and David Hurst Thomas. Tribal culture committees and tribal historians have also contributed essays. Frances H. Kennedy, editor and principal contributor, wrote short entries on more than one hundred of the places. Royalties will be donated to the National Museum of the American Indian. W. Richard West Jr., the museum's founding director, is the primary adviser to American Indian Places. Native American Rock Art and Symbols? Ancient Civilization Symbols? Alien Signs? My name is Matthew Parker, nephew to Milas Parker who sold the Judaculla Rock many years ago. We trace our Parker lineage to the Judaculla Rock site located in Caney Fork, North Carolina, to ca. 1750. Jerry Parker, who presently resides next to the rock, is my cousin, and he is the son of Milas Parker. Owning hundreds of acres (containing several additional petroglyphs), the site and location continue as part of our family history and heritage. As bizarre as the following may seem, it is true. My birth was at the exact minute that the Winter Solstice occurred, while my only son was born when the clock struck and literally signaled that the Summer Solstice had arrived. I never thought much about solstices or equinoxes, but that changed when my son was born. The chance or opportunity to be connected to ground zero, and for me and my son to be born during the exact minute that each solstice materialized, is somewhat intriguing to me. Ray Urbaniak, Rock Art Researcher specializing in Solstice & Equinox Markers and author of "Anasazi of SW Utah: The Dance of Light & Shadow, has a gift for discovering, uncovering and interpreting Rock Art. And his findings of the solstice markers on Judaculla serve only to add to the story. The Summer and Winter solstices are significant to some while meaningless to others, but both generally, universally, relate to religious and spiritual beliefs. At Stonehenge, for example, folks gather for each of the annual solstices. One may also enter the solstices in any given search engine for an exhaustive return on the subject. Jesus, and his cousin, John the Baptist, were born exactly six months apart, with Jesus born on the Winter Solstice and John on the Summer Solstice. The Talmud even has some interesting information on both the solstice and equinox, while the Maya and Inca also place much significance on the events. Perhaps, more than anything else, it merely explains to my family why I am a total night owl and my boy is not. Many questions have yet to be answered about all those scribbles and scratches on the continent's many petroglyphs, but one thing is absolutely certain, the rock art was meant for others to see. But are we the others? The oceans were highways to America rather than barriers, and when discoverers put ashore, they were greeted by unusual inhabitants. In Discovering the Mysteries of Ancient America, the author of The Atlantis Encyclopedia turns his sextant towards this hemisphere. Here is a collection of the most controversial articles selected from seventy issues of the infamous Ancient American magazine. They range from the discovery of Roman relics in Arizona and California's Chinese treasure, to Viking rune-stones in Minnesota and Oklahoma and the mysterious religions of ancient Americans. Many questions will be raised including: What role did extraterrestrials have in the lives of ancient civilizations? What ancient pyramids and towers tell us about the people who built them? Are they some sort of portals to another dimension? What prehistoric technologies have been discovered, and what can they tell us about early settlers, their religious beliefs, and possible other-worldly visitors? Did El Dorado exist, and what of the legendary Fountain of Youth? Was Atlantis in Cuba? What are America’s lost races and what happened to them? Discovering the Mysteries of Ancient America brings to the fore the once-hidden true past of America’s earliest civilizations. Frank Joseph is the author of The Atlantis Encyclopedia (New Page Books), as well as a dozen other books on history, prehistory, and metaphysics. He has been the editor-in-chief of Ancient American magazine since its first issue in 1993. He lives in Wisconsin. Wayne May is the founder-publisher of Ancient American. Laura Lee is the award-winning producer and host of the nationally syndicated "The Laura Lee Show". David Hatcher Childress wrote the best-selling Lost Cities series. Zecharia Sitchin is the author of the best-selling Earth Chronicles series. Andrew Collins is world-renowned for his consistent bestsellers, including Gateway to Atlantis. From the Inside Flap: Utah has long been known for its spectacular landscape. But not as many people know that Utah's prehistoric rock art is equally as impressive. In fact, Utah has thousands of rock art sites, including a large number of the finest panels to be found anywhere in Europe or America. The sites are tucked among the arches and reefs and along the walls of the winding canyons. Whether pecked or painted, at least ten distinct styles of rock art can be seen in Utah--including the oldest documented Barrier Canyon style--representing and art-making tradition with a time span of at least 8,000 years! Art historian David Sucec provides perceptive analysis for the photographs. Leslie Kelen's "conversations" with members of the Ute, Paiute, Hopi, and Northwest Shoshone tribes inform us about rock art from the Native American point of view--its historic significance, cultural impact, ritualistic importance, and sacred nature. This book of magnificent photographs and insightful text is the next best thing to hiking there yourself. The images gathered do not reflect isolated or occasional artistic phenomena, but reveal an interrelated and interacting artistic universe. Locations Available with Optional Subtitles In English or Spanish. Entertain and Relax - Inspire Conversation - Set the Mood - Bring Your Home To Life! -- Earth VideoWorks DVDs are 'the most creative new idea for entertaining to come along in quite some time.' They will transform your blank, black TV into a colorful, fascinating gallery of art - alive with music. Your TV will become an interesting, ambient background and a conversation piece while entertaining guests! All Earth VideoWorks DVDs are set for continuous play! Director L.H. Deutman, founder of Earth VideoWorks and videographer, is a contemporary artist and nature photographer whose work has been displayed in Sedona and Santa Fe galleries. She is literally plunged into a swirl of chaotic occurrences, while the characters she encounters on this odyssey reveal the deeper, hidden knowledge she doesn't even realize she has asked for. Like every hero, Amanda is thrown into crisis, questioning the fundamental premises of her life that the reality she has believed in about how men are, how relationships with others should be, and how her emotions are affecting her work isn't reality at all!